It is always a good thing to have an affordable sampler of the “strange stories” of Robert Aickman available again from a mainstream publisher. I say sampler because this selection is not a “best of” volume. Indeed, Aickman’s most celebrated stories are not included here. 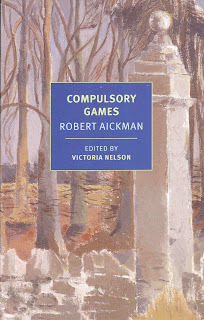 Compulsory Games contains fifteen stories, plus an introduction by editor Victoria Nelson. The story selection was limited, as Nelson admits, to stories not included in the Faber four-volume set issued in 2014; that is, stories not in Dark Entries (originally 1964), Cold Hand in Mine (originally 1975), The Wind-Dark Sea (a 1990 U.K. abridgement of the 1988 U.S. compilation, which was kind-of a posthumous best-of collection), and The Unsettled Dust (a 1990 U.K. compilation that takes the stories omitted from the 1988 The Wine-Dark Sea and adds to it). These Faber volumes are devoid of bibliographical and copyright details. 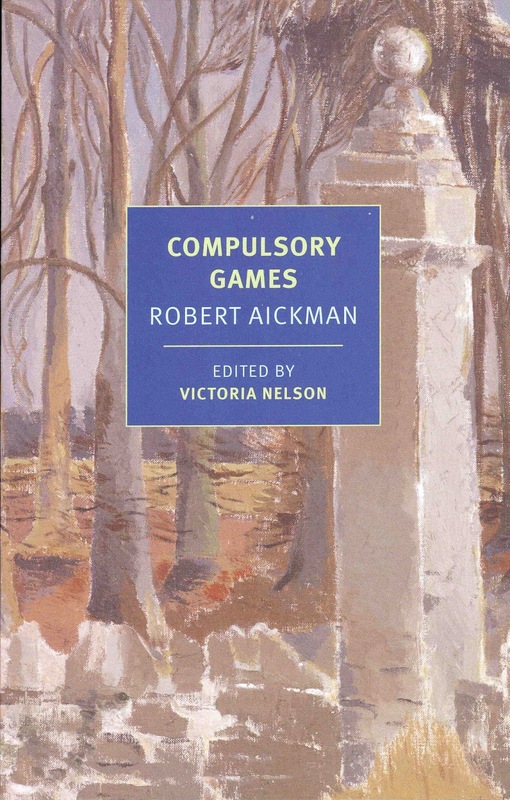 So too Compulsory Games, the new compilation from New York Review Books, which confusingly claims the stories © 2016 by the Estate of Robert Aickman, yet notes the selection is © 2018 by NYREV, Inc. This cavalier attitude towards essential information is really frustrating. As to the stories themselves, four of them (“The Strangers,” “The Coffin House,” “A Disciple of Plato,” and “The Fully-Conducted Tour”) come from the 2015 Tartarus Press volume, The Strangers and Other Writings, a kind of mop-up Aickman collection, including previously unpublished materials, limited to 450 hardcover copies. So it’s good to see some of this rare material made available again, and in a readily available trade paperback. The presentation is nice, and the editor’s introduction is adequate, if a bit sniffy at times—Nelson begins with a claim that any Aickman story is “unshaped by the procrustian bed of genre”—something that is simply not true, for Aickman himself was clearly very well-read in the genre, though in his own writings he deliberately struck out on his own. He developed his own rules and style, but he was still certainly shaped by his thorough reading of the genre. (The anxiety of genre also shows up in John Darnielle’s blurb on the rear cover of the book.) Nelson also makes note of some interesting features in what she calls Aickman country. Nelson’s 2001 volume The Secret Life of Puppets (Harvard University Press) was an eclectic and interesting look at how views of the supernatural permeate modern culture. Nelson recently published a list of the "10 Scariest Horror Stories" which includes Aickman's "The Trains" as number 1. Read the piece here. Compulsory Games is published in the U.S. on May 8th and can be ordered from Amazon.com ($17.99), and in the U.K. on June 14th from Amazon.co.uk (£12.99). I ordered this book with some trepidation, not sure what I was getting,but only on the merits that this was an Aickman collection. Thanks for clearing up this edition's peculiarity. I don't see what your problem is. The stories themselves are copyrighted by the estate. The decision which stories to select from Aickman's works is an original decision of the selector and is properly copyrighted by the selector. I want the historical context, and the bibliographical details to be correct. It makes a difference to me to know which stories were published in Aickman's first collection, and which were posthumous (meaning Aickman didn't bother to publish them himself). And the copyright details matter. The way this collection is sourced shows pure sloppiness.